This entry was posted on June 11, 2014 by Christopher Martin. 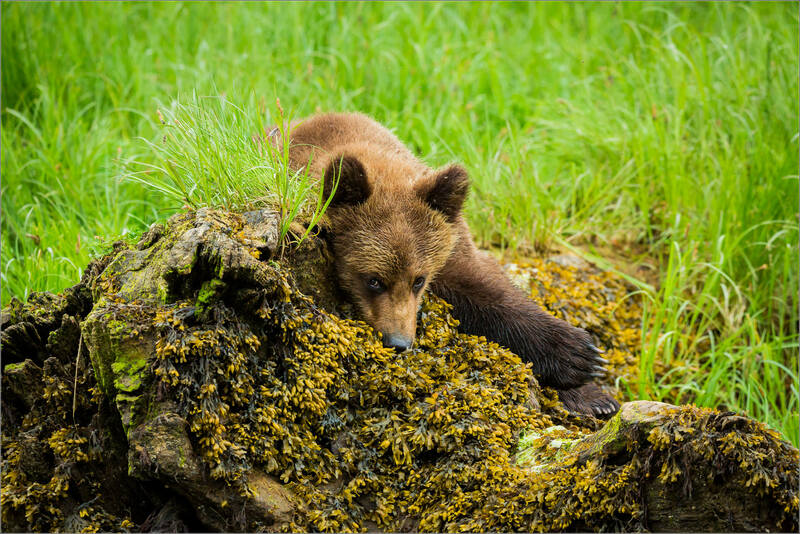 It was filed under Bears, Wildlife and was tagged with baby, British Columbia, brown bear, coast, cub, Great Bear Rainforest, Grizzly Bear, K'tzim-a-Deen Grizzly Bear Sanctuary, Khutzeymateen, nature, Provincial Park, wildlife. Easy to see why you love this shot. It’s a great image and very appealing (the way he is sprawled over the rock). Yes I remember that your old images were stunning and this cub is so cute, so trusting, the image is everything I could expect.I guess when food is plentiful and the bears are not harassed things can go well. Do you think there is a point where the balance will be tipped by too many visitors ? What etiquette does one practice in a situation such as this? It sounds like people can stay on the water, as you did, but cannot go onto the land. Thank you for providing the link to the sanctuary and the tours. I look forward to more of your photos from this trip. I absolutely loved your last images from out there so I am looking forward to seeing these. If this is any indication of what is to come then I can’t wait to see the rest. This is a beautiful shot. Hopefully you got better weather this time. I remember last time it seemed as though it was raining non stop.